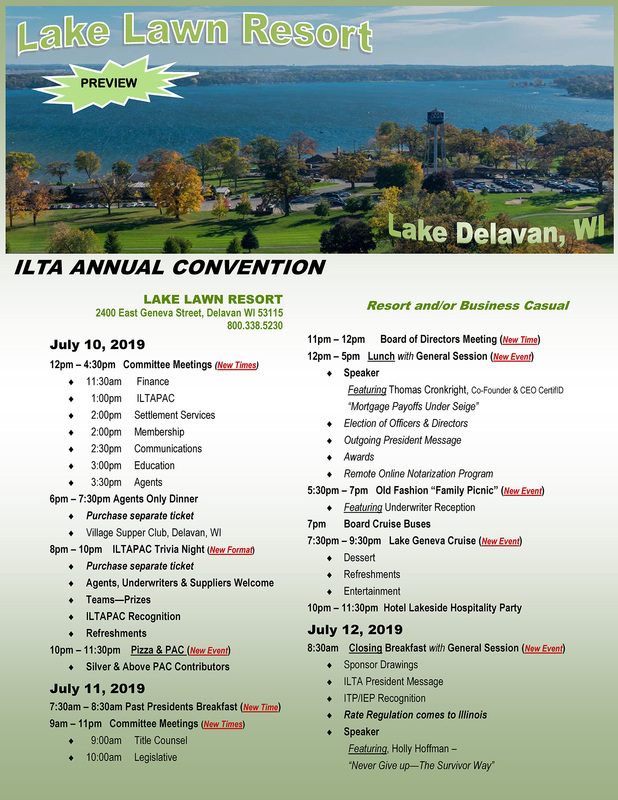 ILTA kicked off its 2018 Annual Convention July 11th through the 13th at the historic Pere Marquette Hotel in downtown Peoria. The Convention is two and a half days filled with committee meetings, general educational sessions and plenty of time to socialize with others in the industry. The first day’s committee meetings concluded with an Agents member dinner and the now famous ILTA-PAC trivia night. The proceeds from Trivia Night are used for the ILTA Political Action Committee. A big thanks to the Trivia Night Committee and MC Terrie Miller for putting on such a good natured event to really kick-off the Convention. The second day of the Convention started off with additional committee meetings and the Board of Directors meeting. If you are not a committee member, please consider joining one of the many committees. Contact the Association to sign up for committee membership. The afternoon general session included the American Land Title Association report given by Maureen Pfaff of Olympic Peninsula Title Company in Port Angeles, Washington. Mrs. Pfaff joined ALTA’s Board of Governors in 2017. The afternoon session continued with a Panel Discussion on Market Conduct. A special thanks to Margaret Cook, Deputy General Counsel and Senior Vice President of Alliant National Title Insurance Company; Frank Pellegrini, CEO Prairie Title; and Christine Sparks, Senior Vice President Chief Operating Officer of Attorney’s Title Guaranty Fund for participating on the panel and providing a lively discussion. The session concluded with the election and installation of Officers and Directors for the 2018-2019 term. Thank you to all new Board members and those members leaving the Board. A special note of congratulations to Tricia Kiddell of Title Underwriters Agency for being named ILTA President for the 2018-2019 term. The day’s events concluded with an ILTA-PAC reception in the historic Presidential Suite for Platinum, Gold, and Silver contributors and a dinner cruise on the triple decker paddle wheel The Spirit of Peoria. The cruise allowed for a more relaxed and casual gathering to converse with other members. The last day of the Convention got underway with a breakfast for Illinois Title Professional and Illinois Escrow Professional designees and ILTA’s First Leadership Academy Alumni. The day’s general session included State Reports from Colorado, Indiana and Missouri and an Illinois Legislative and IDFPR update. The general session concluded with a presentation by Ted Jones, Chief Economist-Senior Vice President, Stewart Title Guaranty Company. For those that have not had a chance to hear Ted speak, he puts a lively spin on the economics that drive the real estate industry. It has been an honor and a privilege to serve as the Association’s President this past year.